In the '70s, atomic cascades were used as the first sources of polarization-entangled photon pairs, making it possible to test nonlocal aspects of quantum mechanics for the first time. In our experiment, we have provided a new perspective on cascade decay by engineering a setting that is hardly reachable in the realm of atomic physics, namely, one in which a single emitter is coherently excited and decays into individual, well-defined, continuously monitored field modes. Our emitter is an artificial atom with transition frequencies in the microwave domain, stongly coupled to a one-dimensional waveguide. 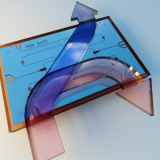 The emitter is prepared in a coherent superposition of the ground and second-excited state; when it decays, the coherence of its state is mapped onto two itinerant photonic modes, which we characterize using nearly-quantum-limited linear amplifiers. 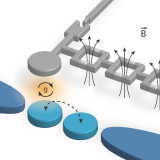 The ability to generate entanglement between spatially separated, itinerant radiation fields, as demonstrated in our experiment, is essential to quantum information distribution protocols. On November 30, 2016 one of the largest quantum physics experiments will take place. 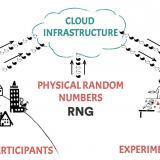 The "BIG Bell Test" is a worldwide "citizen science" project, coordinated by the Institute of Photonic Sciences, which intends to carry out a set of simultaneous quantum physics experiments in eleven different labs around the world, including the Quantum Device Lab. To be successful at least 30'000 people are supposed to generate random sequences of "zeros" and "ones" by playing a video game. More information on the "Big Bell Test"
For a quantum computer, switching a signal carried by single microwave photons is desirable in scaling up superconducting circuitry. In this work, we design and build such a switch, integrate it on a chip with a single-photon source, and prove that it works with nonclassical microwave input. Our device offers negligible heating, relatively large bandwidth, low nonlinearity, and single-pole double-throw switching in mere nanoseconds. It is well suited for applications where signal routing must be controlled by real-time feedback, as in multiplexing qubit control and readout, or distributing entanglement in quantum networks. 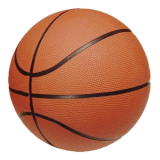 Can you roll a basketball on the floor so that the ball comes back to the same position, but the orientation of its pattern has changed? Yes, you can, and after a few tries you will find out that the final orientation of the pattern is determined by the path traced by the ball on the floor. Quantum systems behave pretty much the same way: when subjected to a slowly varying external field, they acquire a phase that depends on the path they trace in their Hilbert space, that is, a geometric phase. 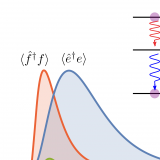 In this work we have studied what happens when the external field is itself a quantum system, namely, a harmonic oscillator which can be populated with any number of photons. Instead of varying the state of the field, we prepare the field in a given state and slowly vary its coupling to the system. What we find is that a geometric phase is acquired even when the field is in the vacuum state, a result that has no semiclassical explanation but is correctly predicted by a full quantum theory. Our ability to control this phase opens new possibilities for the coherent manipulation of hybrid atom-cavity systems, with direct implications for quantum information processing. The results are published in Science Advances.